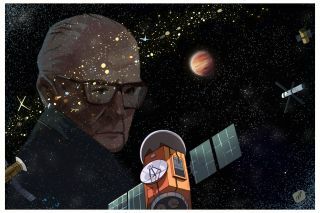 An artist's illustration of a "Clarke exobelt" of alien satellites, with a portrait of inventor and science fiction author Arthur C. Clarke. Alien civilizations with technology on a par with humanity's could be detectable using today's instruments. A new study suggests that if geostationary satellites are thick enough around an alien world, they could be spotted with telescopes already hunting for undiscovered planets. Both governments and private corporations on our own world use geostationary satellites — which orbit such that they hover over the same spot on Earth — for science, communications, espionage and military applications. "It's … a small chance, but the point is that it's free," study lead author Hector Socas-Navarro, of Astrophysics Institute of the Canary Islands, told Space.com by email. Socas-Navarro simulated the presence of belts of geostationary satellites around exoplanets, to see whether they could be detected by instruments like NASA's Kepler space telescope and the agency's recently launched Transiting Exoplanet Survey Satellite (TESS). He found that the belt would need to be about 0.01 percent full for such spacecraft to detect it, whether populated by many small satellites or a handful of large, city-size objects. "We just need to look for the right signature in the data," he said. Socas-Navarro calls this hypothetical structure the Clarke exobelt (CEB), after famed sci-fi author Arthur C. Clarke. Both Kepler and TESS detect planets using what's known as the transit method. The spacecraft watch a field of stars for an extended amount of time. If a planet has the right orbit, and the timing is right, that world will pass in front of its host star from the telescope's perspective, causing a small, potentially detectable dip in brightness. In addition to working as an astrophysicist, Socas-Navarro hosts a weekly radio show and podcast. That work helped him come up with the Clarke exobelt idea, he said. One day, a listener asked about a geostationary satellite for the sun. "As I was doing the calculations to answer this question, I had this mental image of a satellite transiting across the solar disk," Socas-Navarro said. "That led me to ask myself the question of whether satellites around distant exoplanets would be observable during transit." Sufficient material orbiting an exoplanet causes a small dip in starlight before and after the body of the world makes its transit. Scientists have used this method to discover rings around planets outside the solar system and even around distant solar system bodies. Socas-Navarro said the putative alien-satellite signal would have a signature similar to that of rings — both an exobelt and rings are made up of a swarm of objects orbiting a planet — but there are subtle technical differences in how that signature would look. The signal would also reveal the altitude of the orbiting objects, which could provide a significant clue as to whether the objects were natural or alien-made. A ring system can occur at any number of distances from the surface of the planet. But if the objects orbited at a planet's geostationary height — about 22,200 miles (35,700 kilometers) — they are "almost certainly artificial," Socas-Navarro said. "It doesn't seem to matter too much if they are many small or [a] few large [objects]," he said. "As long as they are spread out all over the orbit, they will basically produce the same signature." He also found that the ideal conditions to spot such a satellite belt would be around dim red dwarf stars located within 100 light-years of Earth. The new study was published last month in The Astrophysical Journal. You can read it for free at the online preprint server arXiv.org. Astronomers have been looking for ways to detect signs of aliens for decades. Many of those methods focus on hunting for civilizations that are more technologically advanced than our own. The problem with that approach, Socas-Navarro said, is that it's hard to determine the path a species far more advanced than humanity might take. In the 1960s, for instance, researchers suggested that an advanced civilization might use Dyson spheres and other megastructures to harvest power from parent stars. But Socas-Navarro pointed out that if a civilization successfully refines the process of nuclear fusion, it may never need to build such structures. Looking for civilizations that are technologically like our own makes more sense, because we know that at least one group followed that path, Socas-Navarro said. SETI surveys hunt for radio signals similar to those that we ourselves inadvertently (and sometimes deliberately) send into space. The production of satellites may also be a step taken by other civilizations. "There is a lot of guesswork involved in the study of possible signatures from extremely advanced civilizations," Socas-Navarro said. "The advantage of the CEB is that it's a technomarker produced by real technology that we already know about." An alien civilization would need to be a bit ahead of our own for our current telescopes to spot its satellites, Socas-Navarro said. By using a compilation of data from public sources, Socas-Navarro determined that at least 1,738 human-made satellites circle Earth, and about a third of them are in geostationary orbits. Assuming that each object is about 3 feet (1 meter) in size, he estimated that Earth would require about a billion times more geostationary satellites for an instrument like Kepler or TESS to spot the objects. Based on the accelerated pace of satellite launches over the past 15 years, he estimated that Earth could host a potentially observable geostationary belt by around the year 2200. Socas-Navarro's calculations suggest that a detectable CEB would need to be filled with 1-meter satellites spaced 100 meters (330 feet) apart, 1-kilometer (0.6 kilometers) cities spaced 100 km (60 miles) apart or some mixture of the two, he said. "Is that a reasonable density of objects to expect from a civilization? I don't make any claims about that," he said. "The only claim is that it's worth looking, just in case." Kepler and TESS are equipped to perform such a search, Socas-Navarro added. "If we are extremely lucky and a nearby star in the Kepler field happened to host a planet with a dense CEB, then Kepler would certainly see it," Socas-Navarro said. He proposed reanalyzing all of the more than 2,600 confirmed planets discovered by Kepler during its main mission and during K2, the extended mission the telescope has been performing since 2014, to see if they bear the faint signals of alien satellites. Kepler scientists use a computer program to sift through the mission's abundance of data and identify worlds, and teams hunting for rings or exomoons also use algorithms. Whether a program would spot a CEB would depend on how that program is set up. "My guess is that they're similar enough that a CEB would trigger a detection, but I wouldn't take it for granted," Socas-Navarro said. "It's easy for automated procedures to miss something they're not looking for." He pointed to Boyajian's star, whose unusual "light curve" convinced some to suspect the presence of an artificial object such as an alien megastructure. "Those prominent dips had gone completely undetected until a bunch of people started to actually look — in the literal sense — at the data, simply because the programs weren't looking for something like that," Socas-Navarro said. TESS has a better chance of spotting a CEB, because that telescope is expected to find a greater number of nearby planets around red dwarfs than Kepler did, Socas-Navarro added. TESS is also just starting out, whereas Kepler's glorious run is coming to an end; the telescope is almost out of fuel and will likely cease operations a few months from now, NASA officials have said.